King’s reputation as a credible, non-violent leader of the civil rights movement was in jeopardy just as he was launching the Poor People’s Campaign. He was calling for massive civil disobedience in the nation’s capital to pressure lawmakers to enact sweeping anti-poverty legislation. But King didn’t live long enough to lead the protest. He was fatally shot at 6:01 p.m. on April 4th in Memphis. 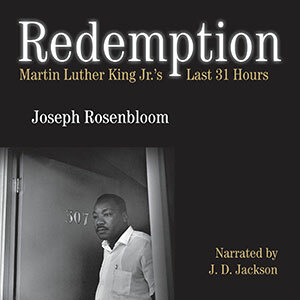 Redemption draws on dozens of interviews by the author with people who were immersed in the Memphis events, features recently released documents from Atlanta archives, and includes compelling photos. The fresh material reveals untold facets of the story including a never-before-reported lapse by the Memphis Police Department to provide security for King. It unveils financial and logistical dilemmas and recounts the emotional and marital pressures that were bedeviling King. Also revealed is what his assassin, James Earl Ray, was doing in Memphis during the same time and how a series of extraordinary breaks enabled Ray to construct a sniper’s nest and shoot King.